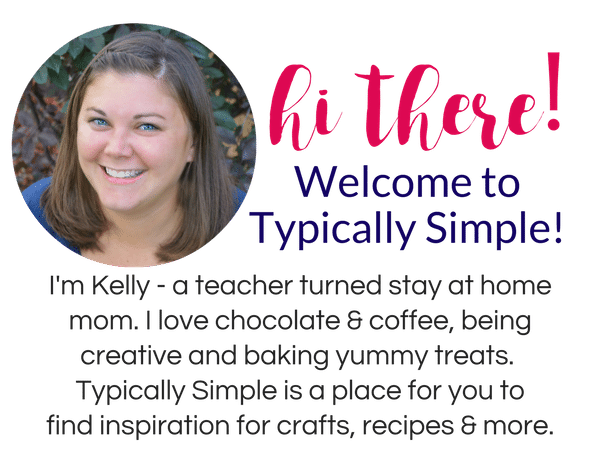 It wasn’t until I became a stay at home mom that I started drinking coffee every day. And when I say every day, I mean all day, every day. As a teacher, I never drank coffee at school; I just enjoyed a freshly brewed cup on the weekends. But now…my day isn’t complete unless I’ve had my morning coffee and an afternoon cup! We are lucky enough to live near a drive-thru Starbucks® where I can grab a cup of hot deliciousness in the afternoon while we are out running errands. While I would love to be able to stop there every day, it just isn’t going to happen, especially once winter hits. 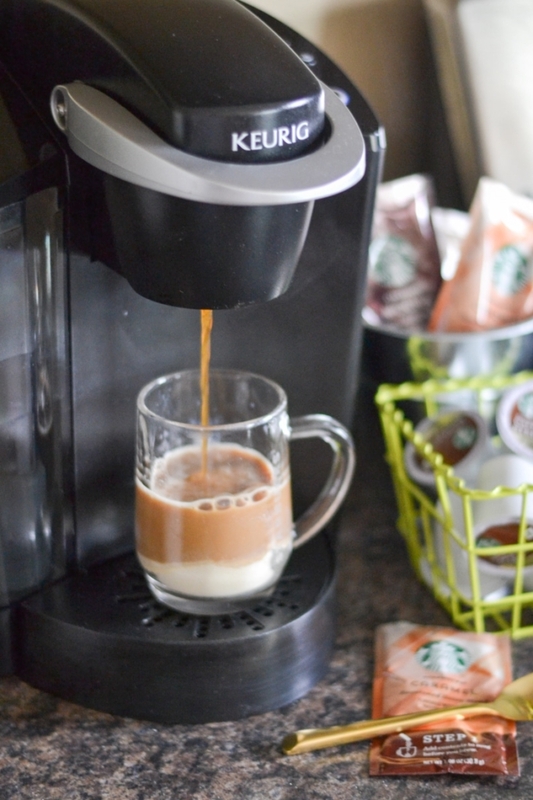 So I like to stock up on Starbucks® Caffè Latte K-Cup® Pods. 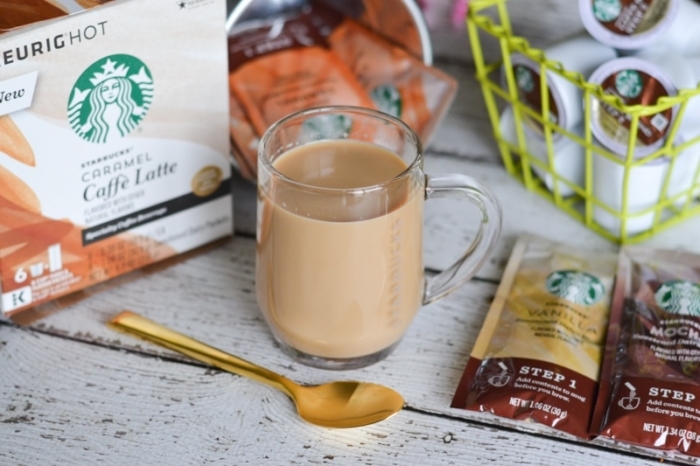 Made from milk and with no artificial flavors, Starbucks® Caffè Latte K-Cup® Pods come in three Starbucks® signature flavors – Caramel, Mocha, and Vanilla. And for all those Peppermint Mocha lovers out there, it will available for a limited time. YUM! 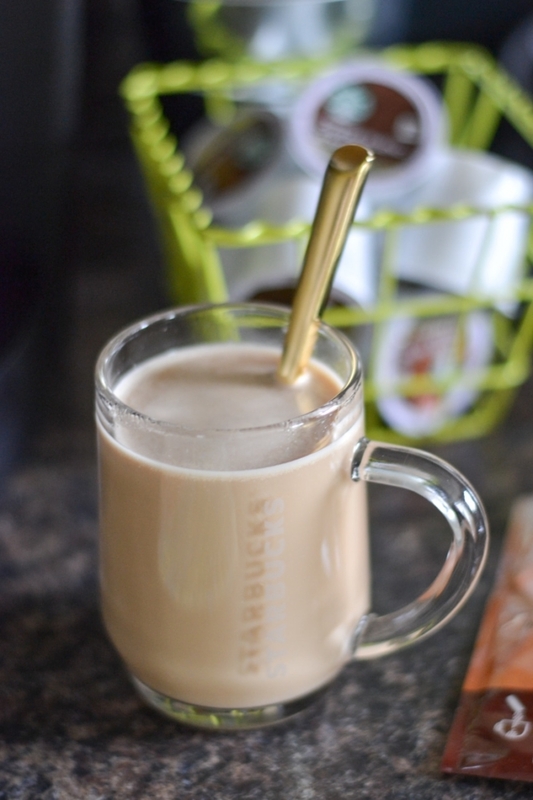 It’s super easy to make a Caffè Latte using your Keurig with a simple two-step process. Add fresh water to your Keurig and place the pod in the holder. Pour one flavor packet into your mug and place on the drip tray. Select the size of your mug on the machine and brew. Stir with a spoon until mixed and ENJOY! 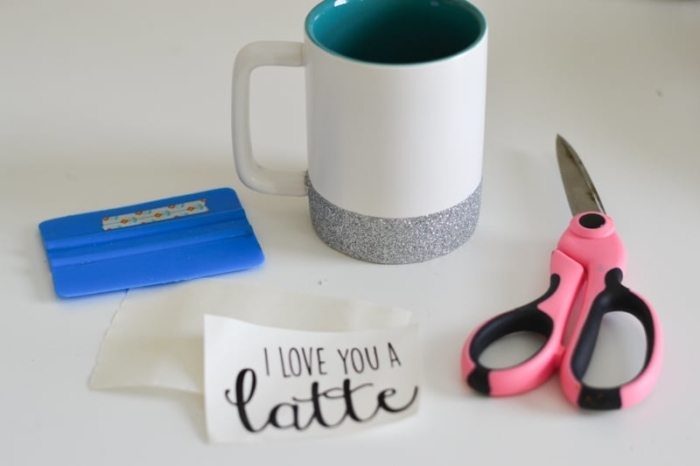 And because it’s always more fun to drink out of a glitter dipped coffee mug, here is an easy tutorial for making a mug that is perfect for celebrating the new Starbucks® Caffè Latte K-Cup® pods! 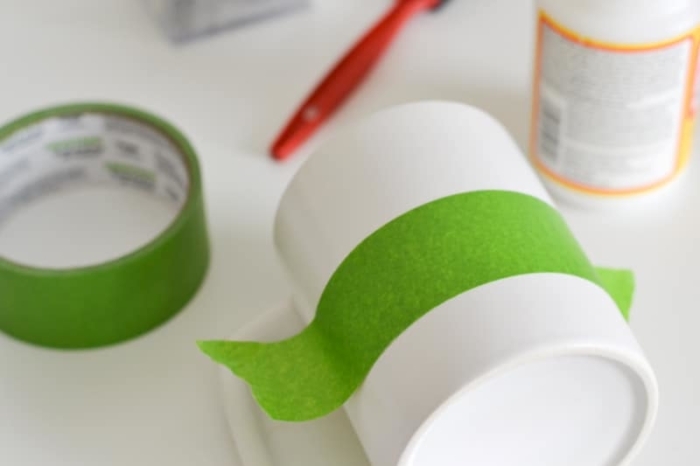 Start by taping off the section you would like to glitter using painters tape. I decided to do a smaller strip of glitter at the bottom because I wanted to add some vinyl words. 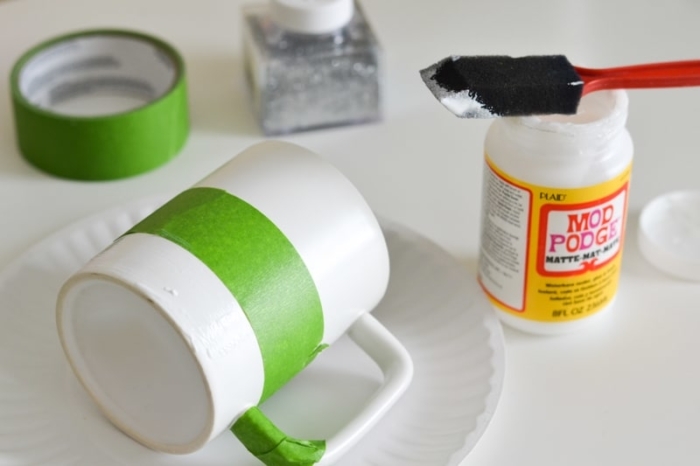 Brush on the decoupage to the bottom portion of the mug using the tape as a guide. I used regular Mod Podge for my project because I plan to hand wash my mug, however there are dishwasher safe decoupages available! 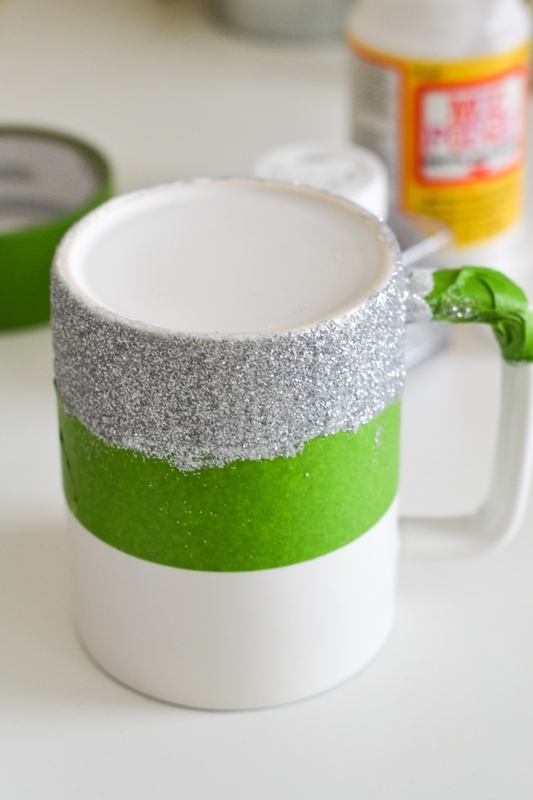 Working quickly after brushing on the decoupage, sprinkle glitter onto the mug over a paper plate or piece of paper. This will help make clean up a little easier. Let it dry for about 10-15 minutes and sponge on a layer of decoupage. 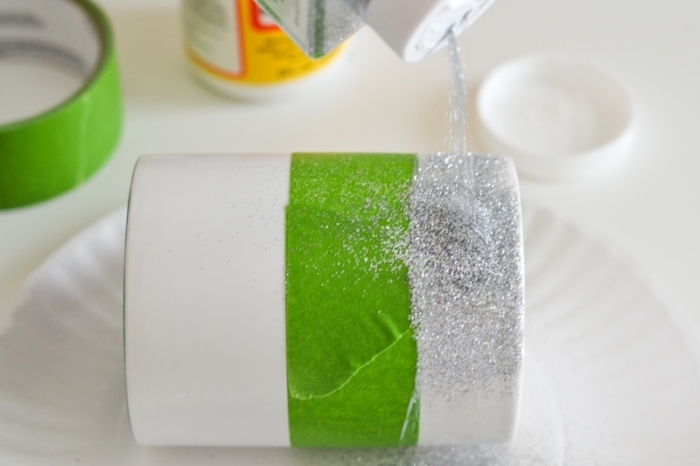 Make sure to use more of a sponging method rather than brushing it on so the glitter doesn’t come off. If you want, add some more glitter to fill in any empty spaces and then sponge on some more decoupage. 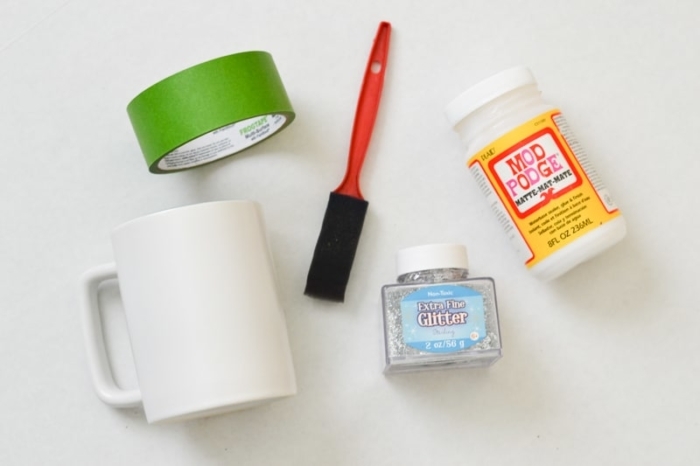 Peel off the painters tape after you have put on your final layer of decoupage and let the glitter dry throughly with the mug sitting upside down. Mine took a few hours to dry. Now for the optional part…I thought it would be fun to add a cute little saying to my mug using some vinyl. 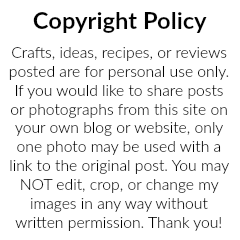 I have a great tutorial HERE for adding vinyl to a mug. 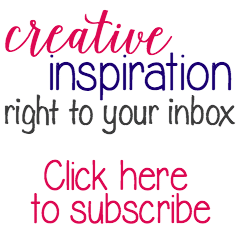 If you do not have a Cricut or Silhouette, you could also use stickers or even a sharpie. 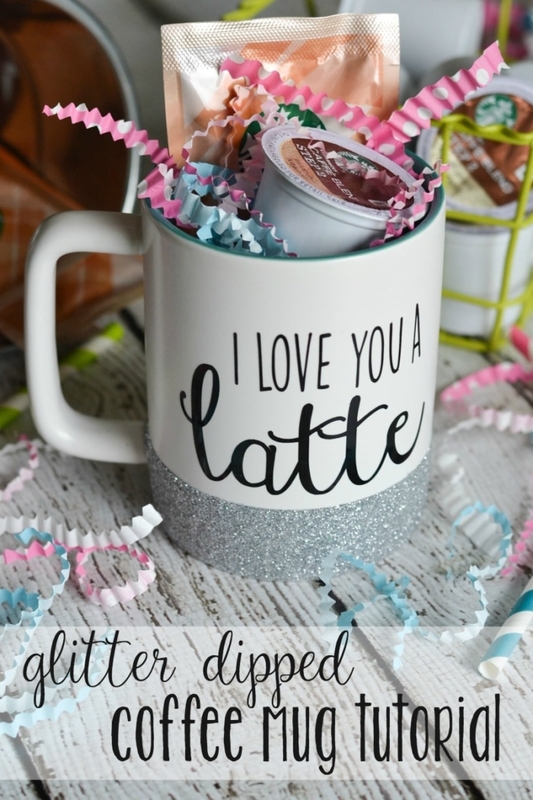 Or leave them blank and glitter dip a few mugs in different colors to add some glam to your coffee station! Due to the glitter and vinyl, it is recommended to hand wash these mugs after use and the mugs should NOT be placed in the microwave. 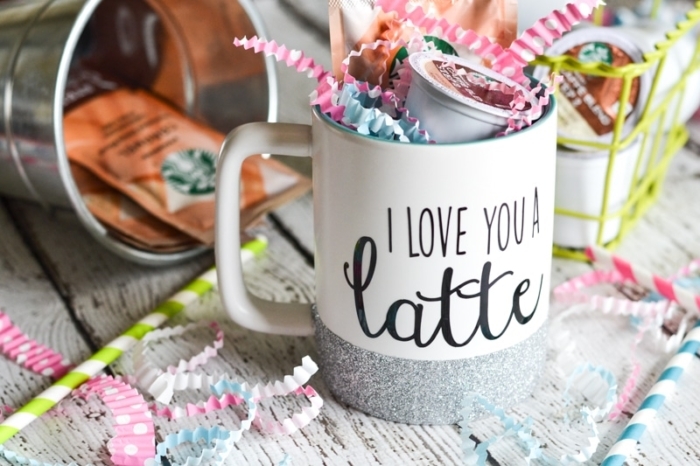 Add some colorful paper filler and a few Starbucks® Caffè Latte K-Cup® Pods… how cute would these mugs be to give as gifts?! 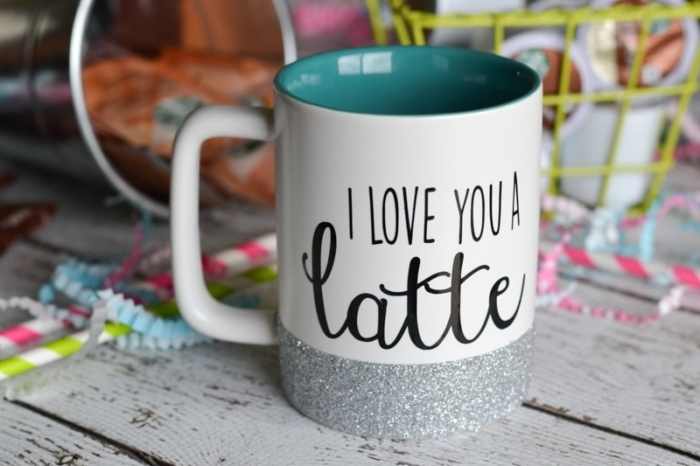 What saying would you add to your mug?